Huge zoom-ranges are all the rage, but does Canon’s latest superzoom bridge camera deliver where it really counts? The 65x zoom is the main attraction but the 4K video capability, high-quality EVF and screen are also very attractive on a bridge camera at this level. The results are reasonable for a camera with this sensor size but we recommend staying to ISO 800 or lower, so it’s most suited to use in good light. While we like the handling and features, the quality of the results in low light makes the SX70 HS less versatile than we’d like. It’s a good choice for days out with the family. Bridge cameras, those models that span the gap between compact and interchangeable lens cameras have enduring appeal. They combine the relative simplicity of a compact camera with some of the more advanced features and handling of a DSLR. And many also bring a wide zoom lens for extra flexibility. 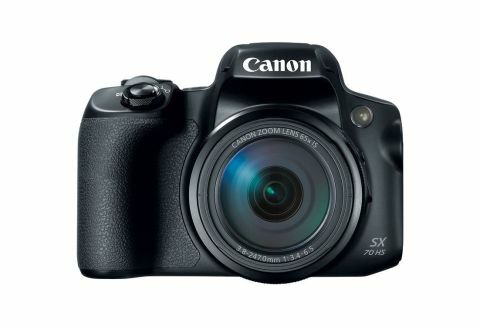 The Canon PowerShot SX70, for example, has a 65x optical zoom, which could make it the best Canon camera for long range photography on a tight budget. To no small part, this monster zoom is made possible by using a sub-APS-C format sensor. In this case the 1/2.3-inch type back-illuminated CMOS chip enables the 3.8-247mm lens to produce and angle of view that’s equivalent to a 21-1365mm optic on a full-frame camera. That’s phenomenal reach and one that few DSLR photographers could ever imagine achieving with their lenses. The SX70 HS has 20.3 megapixels, 25% more than its predecessor, the 16.1MP SX60 HS, that should produce detailed files that lend themselves well both to larger prints and to the rigours of post processing. Sensibly, Canon has included a stabilizing element in the lens and it proves its worth. It’s not just useful for getting images sharp, it helps with framing shots of distant subjects at the telephoto end of the lens. The steadier view makes it much easier than it would be otherwise. This sensor is paired with a Digic 8 processing engine which enables a sensitivity range of ISO 100-3200 and a maximum continuous shooting rate of 10fps in One Shot AF mode (5.7fps with continuous focusing). Although there are just 9 selectable autofocus (AF) points, the SX70 HS’s AF system is actually pretty good. In decent light it gets most subjects sharp quickly. The Tracking AF system also manages to stay with slow-moving subjects well. It’s a contrast-detection system and not surprisingly, it starts to hunt when light or contrast levels drop. Despite its extensive zoom range, the SX70 HS is very light. It’s largely constructed from polycarbonate (aka plastic) but it has a good-quality feel while the deep grip fits comfortably in your hand. A mode dial on the top of the camera gives the means to select aperture priority, shutter priority or manual exposure mode as well as a collection of automated shooting options. However, it’s worth keeping in mind that even at the shortest focal length, it’s only possible to adjust the aperture across 2 2/3 EV, from f/3.4 to f/8. At the longest focal length, there are just three aperture settings available, f/6.5, f/7.1 and f/8.0. That’s not unusual with a bridge camera, but it’s something to keep in mind if you’re looking for a camera that provides lots of control. Both the 0.39-inch 2.36million-dot electronic viewfinder and the 3-inch 922,000-dot screen on the back of the camera provide a good, clear view with plenty of detail visible. It’s nice that the screen is on a variable hinge as that helps with composing images from creative angles, but it’s a shame that it’s not touch sensitive. It means that you have to press a button and use the navigation pad to set the AF point, a tap on the screen would be much quicker and more intuitive. At low sensitivity settings and in nice light, the SX70 HS produces good results but we’d recommend staying to ISO 800 or lower if possible. With a 20Mp 1/2.3-inch sensor the images are not going to challenge an APS-C format camera for quality, but they are good for that sensor type. If you pixel-peep you’ll see that the results at the shortest focal length are a little softer and that the edges of the frame can become a bit mushy, but on the whole they look fine at normal viewing sizes. Chromatic aberration is controlled well, only really being noticeable in extremely high contrast situations. The video quality is also good with the continuous AF system managing to keep subjects acceptably sharp. A crop is applied to 4K video but with such a wide focal length range, that’s not much of an issue with the SX70 HS.